Since Napster first introduced the world to digital music accessibility over a decade ago, the music industry and its role in the digital realm has been consistently challenged and redefined, both by new competitors and by the Recording Industry of America and its multitudinous lawsuits against digital music purveyors of all shapes and sizes. In the years since, a number of successors have attempted to design music-sharing platforms that acquiesce to the demands of consumers to provide comprehensive libraries of easily accessible music, while also limiting the damage to artists and the recording industry as a whole. While Pandora can stake claim to being the most recognizable brand in introducing streaming music and user-designed radio stations, the company with perhaps the most hype and momentum behind it at the moment is Spotify. With a number of recognizable investors and supporters, including Internet wunderkind Sean Parker and actor-turned-venture-capitalist Ashton Kutcher, Spotify emerged on the scene in 2008 and has since grown into perhaps the most formidable entity in the digital music realm. As someone who personally has ridden the wave of digital music from its mostly illegal and inauspicious beginnings, to the vastly different world it is today, I find Spotify to be perhaps the most well-designed and user-friendly of all digital music services. With music remaining an ubiquitous passion of millions of people the world over, I think it is essential to explore more deeply the path Spotify has used to race to the top of this beloved market, as well as the path Spotify continues to blaze as an entrepreneurial model to follow for the rest of us would-be success stories. So how did Spotify, launched by a Swedish startup in an industry rife with more recognizable and existing services, rise to the forefront of the digital music world? By combining an ingenious branding campaign that focused on exclusivity as a means of drawing interest, as well as designing a business model that could appease both digital music lovers and the recording industry that is attempting to win them back, Spotify immediately has risen to the top of the crop of digital music providers. That’s not to say the company does not face the same challenges any new venture faces when attempting to break into a competitive market. Aside from a legion of established competitors, including the aforementioned Pandora as well as long-term industry stalwarts like Apple’s iTunes Store and new rivals like Amazon and Google, Spotify also faces the same oppositional recording industry that has repeatedly attacked rival digital music services with litigation and bad press. However, by designing a business model that ensures revenue streams for music publishers, as well as the same open-source options for program users that drew them in flocks to earlier (illegal) offerings like Napster and LimeWire, Spotify has managed to bridge the gap and provide a service that remains both a legal and attractive option for millions around the globe to access their favorite artists and songs. As the digital music industry continues to adapt and evolve to increasingly attract consumers who previously relied on illegal or unreliable options for their digital music needs, services like Spotify continue to face pressure to find a business model that both appeases consumers, as well as returns a profit for investors. While Spotify has, over the past few years, proven to be both an innovative and adaptive brand in regards to both the service itself, as well as the company’s branding, the question of who will be the name that introduces the new era of digital music sharing remains open. While Spotify’s model remains perhaps the most effective option of appeasing all of the different actors in the digital music realm, the future remains an uncertain path. However, in the present, we as entrepreneurs can glean a number of clear takeaways from Spotify’s rise to the top of the pack. From their initial release campaign, which asked users to provide emails to the company in order to be “invited” to enjoy the service, Spotify has latched onto the philosophy of exclusivity that helped inspire the meteoric rise of other digital-based services like Facebook and Google Plus. This notion of making a service seem “cool” or “exclusive” through marketing tricks like this is something we can take back to our own ventures. While the service eventually expanded to being available to anyone (as was expected from the outset), building this type of hype behind a new venture can help ensure greater media coverage and market saturation from the initiation of the business. Which of us wouldn’t want that for our business? The second major takeaway for us as entrepreneurs can be found in Spotify’s business model. 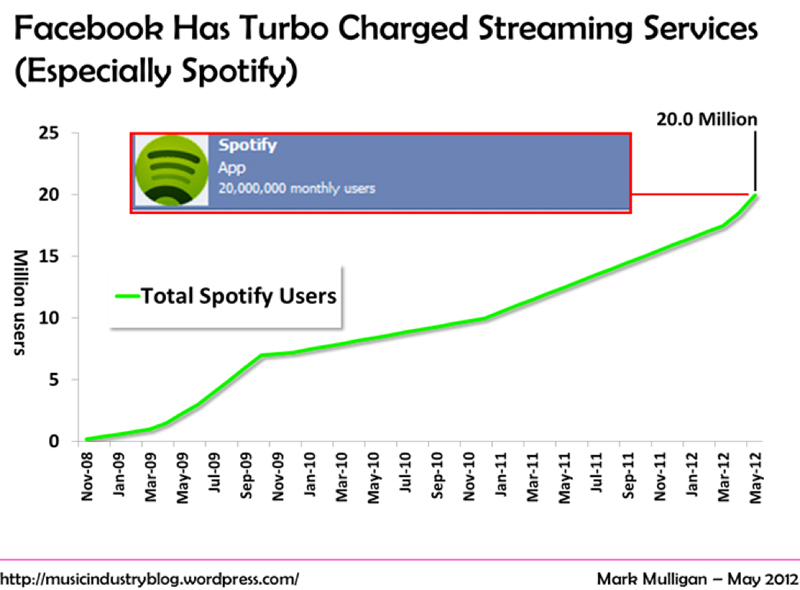 By recognizing the single greatest challenge limiting the market before launch (namely, the RIAA’s opposition in the form of litigation to music sharing) and adapting their business model to appease both customers and potential threats, Spotify has ensured itself a viable path toward long-term success while limiting potential threats to the service’s long term sustainability. As we see in any business venture, identifying potential threats and adapting one’s business model proactively can be the ticket to a successful product. Spotify embodies this idea, and remains a model that we can continue to study and learn from as entrepreneurs in the future.